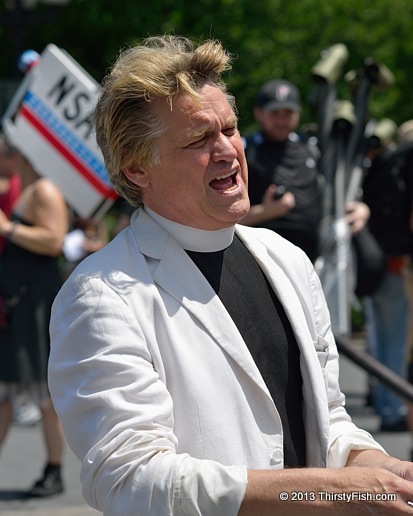 Reverend Billy and "The Church of Stop Shopping"
Reverend Billy Talen is a "performance activist", taking on issues as diverse as consumerism, the environment and NSA spying. He is pictured here during Restore the Fourth protests on Fourth of July. He was arrested last September for organizing a "choir" protest at a JP Morgan Chase bank in Manhattan. Sadly, parody has become one of only effective ways of informing the public. You can learn more about what is going on by watching Stephen Colbert and Jon Stewart than you will ever watching CNN or Fox News. Only a few show interest in issues that truly matter to us, unless it is presented to us as parody. Enjoy George Carlin.